A new section of Britain’s longest road, the A1, has opened, allowing for faster and safer journeys. Costing £400 million, the upgrade has increased capacity on the A1 by adding an extra lane in each direction on the 13-mile stretch between Leeming and Barton, potentially cutting journey times by a fifth for the 70,000 drivers who use the section every day. The project to convert the two-lane dual carriageway to three lanes is said to be the biggest road-building exercise in the north of England, and now means there are motorway links all the way between Newcastle and London. Safety is also expected to benefit and over the next 60 years, the improved road is predicted to prevent 450 accidents and save 20 lives. Access to the motorway has also been made safer, with the addition of a new junction at Catterick and an improved junction at Scotch Corner. The upgrade is part of the government’s £15 billion roads investment strategy, intended to transform Britain’s road network and improve connections between cities. 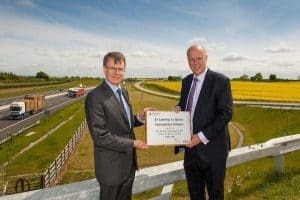 Transport secretary Chris Grayling said the improved road will “make a real difference to people’s lives, providing quicker and safer journeys for millions of drivers”. He added: “This scheme will not only save motorists time stuck in traffic, but will also help unlock £1 billion into the economy. Contractors for Highways England will still be on the site over the next few weeks while minor work, such as landscaping, is completed.